Couple of photos from tonight’s ‪#‎SunsetThePatriotAct‬ protest outside of Sen. Schumer’s offices in Midtown East. Go team Fight For The Future, amazing organizing this week – here’s the main campaign site with lots of helpful info & tools to share: End Surveillance. 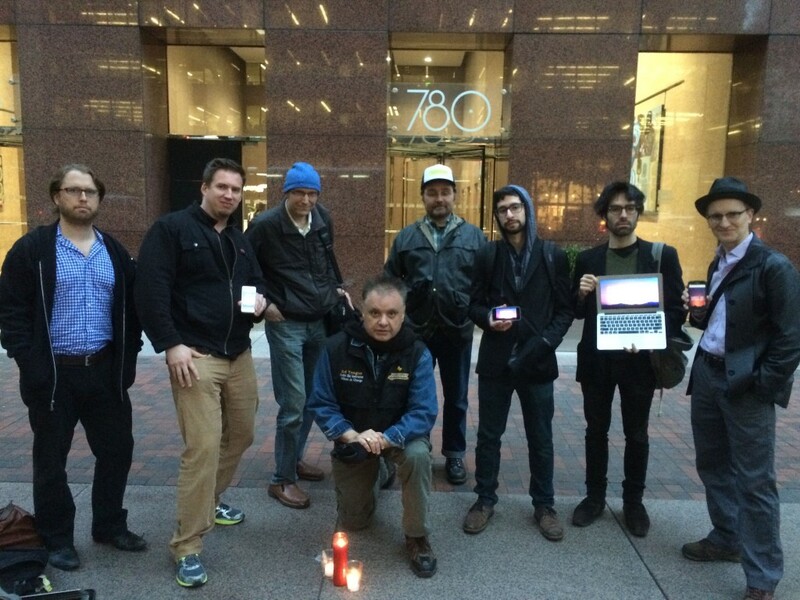 Chris, a West Point graduate ’84, brought a candle to Sen. Schumer’s offices to #SunsetThePatriotAct. Summary: call your U.S. senators offices tomorrow (Friday) and encourage them to allow the “USA PATRIOT Act” to expire. We have an amazing window of opportunity to begin to roll back the NSA’s illegal, unaccountable domestic surveillance programs. Thanks to StopMotionSolo for the full group shot. 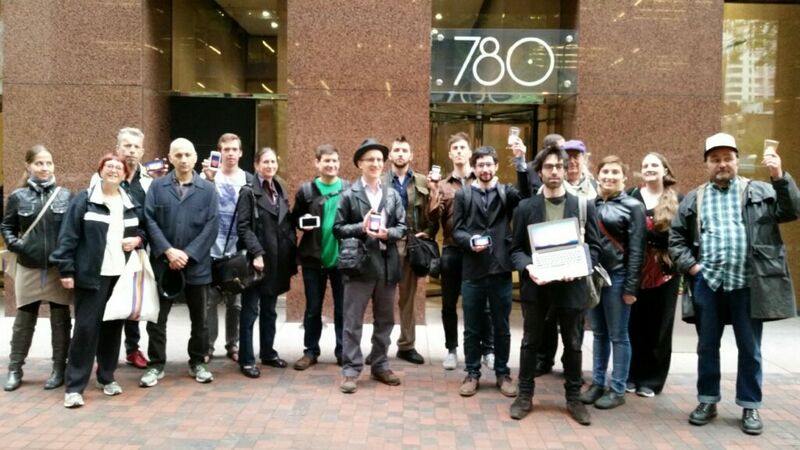 #SunsetThePatriotAct vigil-protest on May 21st, outside of Sen. Schumer’s Midtown East offices in Manhattan. Shot by @StopMotionsolo. Of course, federal bills need to be passed by both chambers to progress into law. The House last week voted 338-88 last week for the USA Freedom Act, a fake reform bill that would codify and extend the Patriot Act’s infamous Section 215 provision that served as ‘legal’ justification for NSA bulk surveillance. But earlier today, the House peaced-out of session and skipped town for a week. Another helpful article from tonight, on Politico: http://goo.gl/khoqfM. So back to the legislative status in the Senate – because of Sen. Rand Paul’s filibuster yesterday (coverage today in The Hill: http://goo.gl/AY3we9), the vote schedule may be pushed to Saturday, after the Justice Dept’s deadline. Here’s an explanation from Donny Shaw and team at FFtF, good for sharing (http://goo.gl/V8r79A) – I seem to recognize this accessible prose style & leg. analysis from a Congressional transparency project of old: “a vote on limiting debate on whether or not to begin debate of reauthorization of the Patriot Act… won’t happen until Saturday… If they do somehow get 60 votes, a final vote won’t happen until Wednesday of next week…. and the House is leaving for vacation today until after the Patriot Act section expires. The House has already passed the USA Freedom Act, which renews the Patriot Act, so the only real way for Congress to stop a sunset at this point is for the Senate to pass that bill. Our vote count shows that the Senate doesn’t have the votes to pass it…” So if Senate doesn’t take up USAF, and House is out of session to not even be able to take up a hypothetical Patriot Act re-up from Senate, that’s a significant change in starting point. We have an incredible window of opportunity to *actually influence* the Senate to allow the Patriot Act to expire and reclaim our fundamental freedom of expression and 4th Amendment civil liberties from the mass-dragnet, fear-mongering, politically-repressive, K-Street-lobbying surveillance state. Lots of talented people are working to further the cause of open technology for structural electoral reforms, widespread rapid social change and free-culture communication and democratic self-determination, and for me the NSA’s warrantless surveillance is such a terrible techno-dystopic catastrophe – but it’s one that right now we happen to have a chance to roll back. Ultimately, we’ll hopefully end these chilling federal practices, or next week we’ll at least have a strong chance to force every member of Congress to affirmatively vote for unpopular, unchecked spying on Americans – let’s keep fighting from that position. Questions & feedback welcome, email: david @ ppolitics dot org, @ppolitics on Twttr.